Manikganj is situated 68 km south-west from Dhaka, on the bank of Kaliganga River. The town was probably named after a Muslim preacher, Sufi Manik Shah, who lived in an island by the Ichamati River, presently known as Maniknagar. 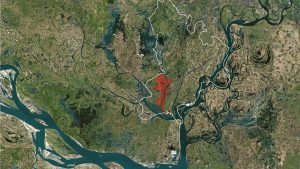 He would later move near Dhaleswari River, which became the Manikganj town in the early 19th century. Evidences found by the old ghat (jetty), the ancient temple and bazaar show the settlement flourished as a ‘ganj’ (market) and its main accessibility was provided by the Kaliganga River and a canal named ‘Nodi Balabanta’. Interestingly, the name cannot be found in official records till 1845. In that year, Manikganj Mahakuma (an administrative unit equivalent to a sub-district) was established by the British administrators. It has finally become a municipality in 1972. The area of the municipality is 42.38 sq. km. and population in the year 2011 was 71,698. The population has increased to almost 200,000 at present (the figure includes floating people). 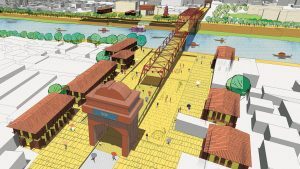 The Manikganj town development proposal which also involves restoration of the canal, is part of a wider scheme called ‘Dhaka Nexus’, which seeks to develop the towns around Dhaka to reduce the ever-increasing pressure on the already overburdened capital. 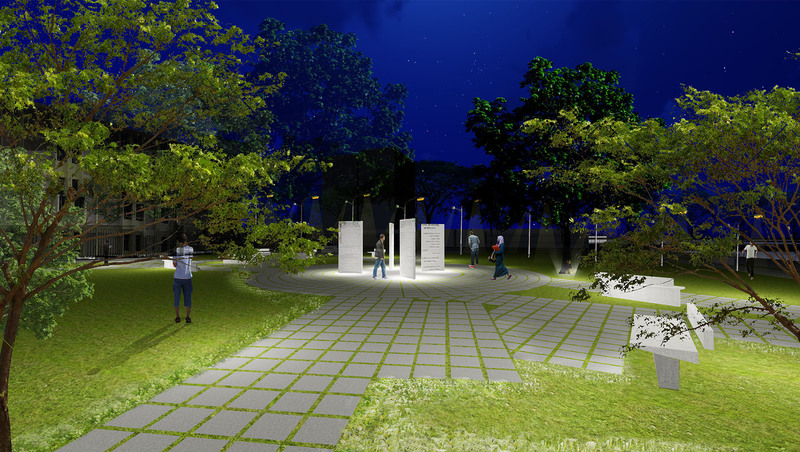 The scheme will try to develop infrastructure to make small towns more livable while maintaining their unique identity. Situated only a few kilometers away from Dhaka, Manikganj is a prime candidate for this treatment and has all the possibility to be a more livable city with adequate employment, quality educational and healthcare institutions, and functioning transportation system. Manikganj can be an excellent cultural hub by improvising the cultural activities in existing setting. Situated amidst the lush green, the city provides ample open space between government institution and transport corridor, in between buildings and around the neighborhood. 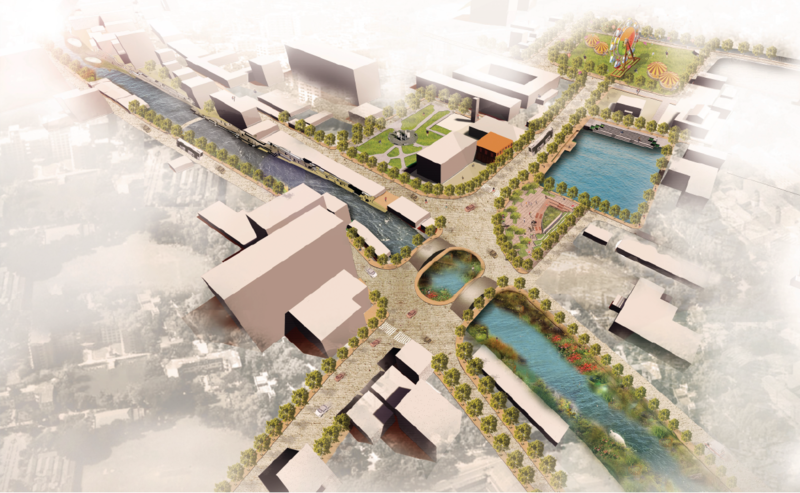 The dispersed open spaces, ponds and canal front, river bank, unutilized space between buildings, neglected children park and unplanned residential area are reorganized by an integrated land use plan. Though the Manikganj Municipality was established in 1972, there is no waste management system in the town. As a result the leftover space beside roads, canal, ponds and back yard of residential area are often encroached by waste dumping. The scattered garbage pollutes the environment and spreads infectious diseases. A comprehensive waste management system has been designed to ensure a cleaner and healthier environment to Manikganj town. Manikganj is a land of water. There are interconnected canals those spill off to the river and numerous ponds. Therefore redesigning a canal front to reclaim public space would be the best solution to reinvigorate a city like this. One particular canal, ‘Nodi Balabanta’, was selected for its location and historical background to set up an example for other waterbodies. It flows through heart of the town beside an old bazar and used to have a strong connection with other parts of the country using the waterway. The canal can still provide a circular water transportation network to the city. Both the banks can be transformed into a lively urban space for the inhabitants to promote environmental and health benefit. 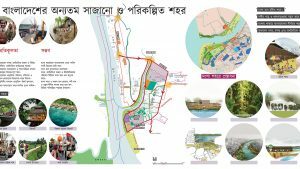 The main access road to Manikganj Sadar, connecting the National Highway to the regional highway and passing through ‘Rafiq Chattar’ and ‘Bijoy Mela Math’ will be converted into an urban promenade incorporating feeder roads, bridge, sidewalks, open space, water bodies and built structures.